A beauty, congrats and happy holidays. Is this a nitro special? It looks like from the engraving maybe from the 40's? A upstate classic. I'm from NY but live in Italy now. You blog is the best. I grew up shooting a .410 single. Been looking around (not too hard admittedly) the last 2 years for an inexpensive double , just have seen a lot of singles. Beautiful shotgun. 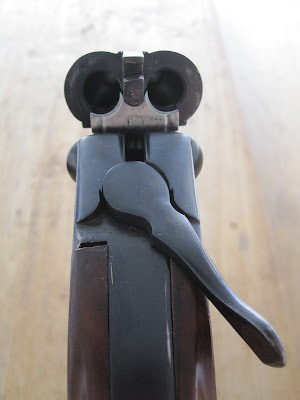 I have to say, I have seen a few shotguns in my day, but never, ever a .410 side x side. Very nice. IT IS A NITRO... THANKS ALL. I've been looking for a nice old side by side. There are heaps available here but we aren't allowed to use lead shot for duck hunting in Australia, and the old guns were never made to handle steel shot. So I make do with my under and over Lanber.